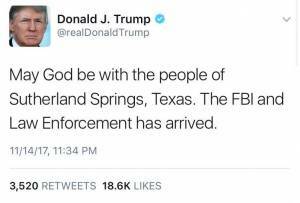 President Donald Trump on Wednesday deleted his tweet that mistakenly mourned the wrong mass shooting. 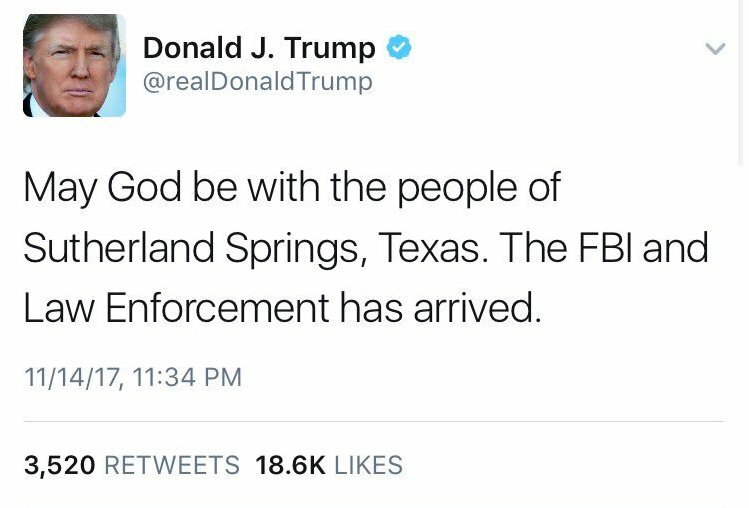 Late Tuesday night, Trump had tweeted that Sutherland Springs, Texas, was in good hands now that the FBI and law enforcement had arrived on scene. Sutherland Springs was the site of a church shooting that took the lives of 26 Americans. Trump likely deleted the tweet because he meant to offer his condolences to residents in Tehama County, California, where a different gunman went on a shooting spree, killing four people and wounding a child at a school. The president's slip of the tongue on Twitter was apparent, considering he had already sent a similar tweet lamenting the shooting in Sutherland Springs. Trump is routinely mocked for his Twitter exploits. He often misspells words and seemingly writes at a fifth-grade level. But one can forgive Trump's fill-in-the-blank "thoughts and prayers" approach to a mass shooting, simply because it's almost impossible to keep track of all the mass shootings in America today. Trump's now-deleted tweet appropriately captures the gun problem the U.S. has had for more than a decade. According to the Gun Violence Archive, the country has seen seen 307 mass shootings from Jan. 1 to Nov. 5. A mass shooting is defined as an incident in which four or more people are shot or killed. The endemic appears to only be getting worse, but Trump and the Republicans in Congress have been steadfast in their resolve to do nothing about it. And that's for good reason; The National Rifle Association boosted Trump's campaign in 2016 on the back of his campaign trail position that more armed Americans means a safer America. Trump's tweets usually provide insight into the unstable mind of an inexperienced politician. But on Tuesday, his tweet about the mass shooting revealed just how large the gun problem is for America.